How long does an atomiser coil last? How long should an atomiser coil last? How long is a piece of string? Pinning down the eternal coil longevity question is pretty much impossible, because of the different variables involved. Certainly as a beginning step, it's more worthwhile to think of coil longevity in terms of the amount of e-liquid that's been vapourised, rather than a period of time, because the amount of juice that's been through a coil is more of a valid measure of coil life, although it's not the whole story. Whether your tank and your vaping style is mouth-to-lung (MTL) or Direct Lung (DL) will usually affect how long your coils last. MTL vapers use higher resistance coils on much lower power settings, for a cooler vape which uses less liquid, therefore, MTL coils typically last longer than DL coils, but not always. DL vapers use much lower resistance coils on much higher power settings. This higher performance and much greater vapour production is very desirable but it does mean that more juice is used and typically leads to a shorter coil life. Other aspects of vaping style include how long you activate your device for each time you take a puff, and how strongly you "pull" on the mouthpiece because this alters the airflow and the airflow can affect the longevity of the coil. This is related to vaping style. If you are a DL vaper, you're running at a higher wattage, and the coil burns hotter, placing extra demand on the wick which can burn and produce a foul taste if the juice isn't wicking through quickly enough to meet your vaping intensity. Of course, higher power often means more juice, and as already mentioned, the longevity of a coil is mostly related to how much juice is vaprourised through it. We've found that some juices have a tendency to "clog up" the coil more quickly than others. This is a case of experimenting to find what works for you. Sometimes it's worth putting up with a slightly shorter coil life to enjoy that fabulous flavour you love. Some say that higher VG juices clog up the coil more, but this could be more to do with the fact that higher VG juices are typically used by DL vapers who go through more juice than MTL vapers. We also commonly see liquid consumption increase when people lower the strength of the e-liquid they use. This can then have an impact on coil life as more juice is consumed. Modern devices tend to perform better and vapourise liquid more effectively. The net result of better performance and better vapour production is that you go through more e-liquid - that's the nature of the beast. If you want a better vaping experience, you will generally use more juice and coils than you would with an older or less powerful device which struggles to keep you satisfied. You may have been used to a longer coil life on an older device which was less powerful and less effective or perhaps your old device had dirty or oxidised contacts or a battery which has been charged and discharged so many times and it's just not as effective any more. It's important not to forget that every tank and every coil is unique and your usual coil longevity will vary from tank to tank even when all other factors remain the same. As time goes on, vapers do tend to develop a greater perception of taste changes in the coil which leads to the necessity to change the coil more frequently than you might have done originally. When you're just moving away from cigarettes, your taste perception can remain dulled for some months and it's only when it really starts to return over time that you notice the coil starting to taste bad sooner than before. Most people experience a shorter coil life the longer they've been vaping (stock heads as well as DIY coils). We sometimes receive reports that the coils seem to have changed and don't last as long as they used to, but it's pretty rare for manufacturers to change anything about the materials or manufacturing of existing coils, and these variances are almost always down to one of the factors detailed in this post. We've found that increased satisfaction with vaping, whether due to a new kit or a new flavour, sometimes leads to an increase in vaping and in juice consumption. People often struggle along with old, poorly performing hardware far longer than they realise, and then when they upgrade, they suddenly notice they have to replace their coils more frequently. This can be due to the better performance of a newer device, or an increase in vaping because it's just a much better experience than it was with the old kit. Some people believe that different climate conditions and temperatures also play a part. Some liquids don't feed very well in some tanks (particularly thicker liquids in MTL tanks) during the colder months, so this will lead to wicking issues, and a poor taste as the wick struggles to keep saturated. There are things you can do which can help make that new coil head last a little bit longer. The first step is to prime your coil. The idea behind priming is to try to saturate the wick within the coil head before first use, to reduce the chances of burning especially if you're impatient and want to use it right away without waiting for 10-15 minutes for it to wick naturally. There are usually juice holes on the side of the head which is where the juice from the tank feeds into the wick. You can carefully place a few drops of juice onto each hole (let each drop sink in before dripping again) and a few drops into the top of the head (avoid the airhole in the middle of the head). You can try taking a few drags from the tank without firing your device. This can be done 4 or 5 times to try to encourage e-liquid to feed through to the coil. Similar to method 2, but generally works better. If your tank is one that has adjustible airflow, close the airflow down completely and do 2 or 3 strong pulls without activating your device. This method saturates the wick more effectively than method 2, however it is quite easy to flood the coil if you overdo it. With experience, you'll learn to sense when the wick is saturated and to stop before it's flooded. Once you have the coil sufficiently saturated, it's a good idea to break it in gently by using a lower wattage for the first few hits. Then gradually work up to your normal wattage once the new coil has bedded in. Many people swear by these processes because they enable you to use new coils right away without risking burning them due to a dry wick. I use a mouth-to-lung tank at 13 watts and I usually get somewhere around 120-180ml through a head before I have to change it because it's tasting bad or feeling clogged. This is pretty much universal for me across most MTL tanks. I use method 3 to prime my coil, so I can start using it straight away without risking a burnt coil. If I am vaping too intensively and the tank is struggling to keep up, I again use priming method 3, just once, to bring more juice to the coil to cope with my intensive vaping. We'd love to know what setup you're using and how long a coil lasts you. We have been working behind the scenes on a new look and feel for our website and we are very excited to finally launch it. Don’t worry, all your details and order history remain easily accessible and you won’t even have to change your password. Desktop and tablet users will notice that the navigation has been moved to the top of the website. 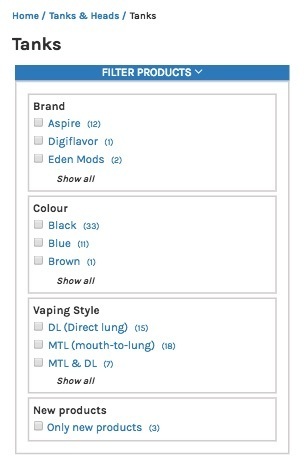 Some products have moved to new categories to make them easier to find (we hope). If you're stuck, the product search box is more prominent and works fabulously. The simple checkout so many of our customers appreciate remains as easy to use as always. Our original site was designed long before mobile devices were in such heavy use for internet browsing and online shopping and we have worked really hard to improve the experience for all. We hope you will find the new layout much more usable on your mobile devices and it provides a cleaner look on tablets and desktops too. The E-liquid category has been completely overhauled making it much easier to find your preferred type and strength, and our new e-liquid flavour selector (available on the home page and in the e-liquid category) makes it easier than ever to find your perfect vape. Product filtering is now available on mobile devices. Simply touch the "Filter Products" bar to open or close the filter options for the category you are in. We have done a lot of internal testing, but should you come across anything you think looks weird or is not working for you, please let us know so we can fix it. We hope to serve you very soon. I’ve been enjoying temperature control for over 4 years now and while it did take me a little time to get my head around it all, once I understood what’s going on with the technology and use that temperature control setting as a scale, not as an actual reference to a real temperature. In 2014 Evolv was the first to market with their temperature control feature in the DNA40. As with all new tech I was eager to give it a try. It worked and did what it claimed to do albeit buggy and in need of some refinement, but I feel there was a bit of a flaw with the terminology used in setting your desired heat level. Sure, one can work out what the approx. temperature of a given wire should be based on the manufacturer’s specification for the resistance changes at different temperatures. This is called the TCR or temperature's coefficient of resistance. In simple terms this means that as a resistance target (the temperature setting) is reached on the TCR scale we can calculate the approx. temp of that wire based on the change in resistance from the room temperature's resistance. But here’s where I think the terminology (but not the functionality) is flawed. We are not using an isolated straight piece of wire alone, we are using a coiled piece of wire attached by two screws or clamps with some sort of wicking material running down the middle with both liquid and air passing across it. Thus an actual temperature value is never going to be entirely accurate nor consistent - there are simply too many other variables at play when it comes to that "temperature" value. Think about the difference between an oven and a hob (stove top). An oven usually has dials so you can set a desired temperature, this is easy for the oven's electronics to control because inside the closed space there is a thermostat (a device that measures the temperature) and this sensor is used to help regulate the power applied to the heating elements (coils) inside the oven to maintain that set temperature. Now take a look at the hob controls, these are normally dials or buttons that have a scale (ours goes from 1 to 10). There is a good reason why the hob has no temperature settings on those dials. There is usually no means for the electronics to measure the actual temperature of that particular heating element on the hob. This is also true with our vaping devices, there is no sensor to measure the actual temperature inside the atomiser's chamber. Therefore, I think it may have been better to use a scale from 1 to 10 or 1 to 20 for this setting on a TC device, but this is not the direction the market took and we have to understand the quirks of this technology and understand what’s actually going on. TCR value, every wire material type has a recommended value. This value is what the manufacturer of that wire states the resistance change is at a given temperature. In our vape devices we are using a max temperature coefficient of around 600F. The TCR value is how much change in resistance it takes to go from room temperature to a max of 600F. When you set your "temperature" on the device you are not actually setting a temperature, you are setting a resistance target on that TCR scale. Wire materials are not 100% consistent across all batches, all manufacturers etc etc... This is an approximation only and should only be used as a reference value to start with and most all devices on the market have the ability to set a custom TCR value, use this feature if you need to, do not rely on a wire type setup in the device from the factory as the default only. Personally I find that Ni200 having the highest change in TCR works best for temp control as there is a greater change in resistance as the wire heats up. Low TCR value wires such as stainless steel are not as stable and can fluctuate as the device attempts to work out the setting on very small changes which leads to a jumpy temperature that you can actually feel as you vape on some devices. The TCR value is based on the wire ITSELF, not all the other external factors such as liquid hitting it or air passing over it. Wicking, this is a big one. As the temperature control device attempts to read the resistance change there is (or should be) a constant flow of liquid hitting the wire which in turn cools it down again and the device is able to hold a desired setting while you vape. If your wick/material or atomiser is not keeping up with the heating element the resistance climbs quickly and the power is reduced to maintain your target resistance (temp setting) and this leads to a weak vape -by design- keeping you from over heating the wick and getting a burnt taste from your juice. Too much liquid flow and things can go the other direction resulting in flooding and spitting as you actually get some boiling of the liquid. There is fine balance here between not enough liquid to the coil and too much. You just have to gain experience with this area and know your atomiser's ability to keep up with the wicking required in TC vaping. Don't be scared to experiment with different wick materials and amounts of wick you install in the coil. Some materials are better at keeping up than others, and what works for your friend may not work for you and your application. Every juice also has a different viscosity at different temperatures so bear in mind on warm days you may experience different wicking than you would on a cold day. Air flow, another big factor. The amount of air passing across the coil cools it down significantly and lowers it's resistance. But air flow also has another role to play with an RTA. The amount of air pressure you apply by puffing on the device compared to the air hole size actually pulls liquid into the wicks at different rates. Every person puffs on their device with a slightly different pressure every time they vape and this can actually change though the day too. It's just not possible for a human to pull the exact same pressure on the mouthpiece every puff, all day long. As the market moves back to the mouth-to-lung style vape we are finding that the puff pressure has been decreasing a bit as the air hole sizes decrease (this was the norm 5 years ago). When you are vaping on an atomiser with large air holes and you are taking direct lung hits there is a lot of air passing the coil keeping it cooler and also pulling more liquid to the coil which can result in a warmer vape. With an MTL setup you may experience a weaker vape with TC as less air is passing the coil and less liquid is entering the chamber, you will need to experiment with the settings to get your desired vape, remember what I said before and think about temperature control as a sliding scale rather than a set of actual temperature values and bear this in mind when you are setting up your temp control device. Connectivity. Every mod has a 510 connection on the top where you screw your atomiser down onto. This is a weak point for every temp control system. The threads are where the negative side of the circuit passes current. If your threads are dirty or wet with liquid (on either the mod OR the atomiser side) this can lead to an inaccurate temperature control experience. Make sure your threads and the 510 centre post on both the mod and atomiser are very clean and dry at all times to avoid issues of varying resistance (often called "Jumping"). If you knock or drop your device it's always a good idea to double check your settings and re-calibrate your coil to be sure everything is normal. I hope this helps you understand a little better what may be happening inside your temp control device. Don't be too quick to jump to conclusions that your mod or atomiser may be faulty if your TC vape experience is not what you think it should be as there could very well be a small detail that's causing an issue for you. Don't be afraid to experiment with different wick materials, atomisers, or wire types. You may just find your perfect vape. What works for you may be completely different to what works for me. For temp control vaping, my favourite device is the Dicodes as it offers a stable and accurate experience. The room temperature resistance of the coil is locked by the user and the display on the firmware provides the ability to check at any point in time what the calculated resistance and temperature of the coil is (R/T menu) This gives me the ability to double check the coil at room temp to be sure nothing has changed or if it needs a recalibration, this is not a feature available on any other mod on the market (without hooking up to a PC and using software anyway). Well, finally, shortfill "shake and vape" e-liquids have arrived at Crème de Vape. They provide a cost-effective way for vapers to obtain larger bottles of e-liquid and avoid having to deal with all those little bottles. Why has it taken so long for us to get them in? Good question - I'll need to provide a bit of background to answer it. 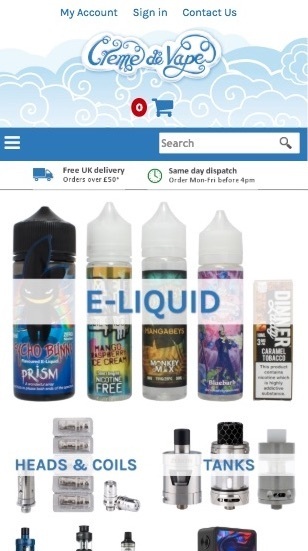 We noticed shortly after the end of the TPD transition period in May 2017, retailers started offering large bottles of flavoured e-liquid without nicotine, with empty space for TPD compliant flavourless nicotine liquid to be added by the consumer because the TPD/TRPR regulations do not currently apply to liquids without nicotine. This has been seen by many as a positive development, however, it was unfortunate that so many producers rushed in to take advantage of this loophole with all manner of completely untested liquids. We've spoken to many companies over the years who simply don’t care to test their product and seem not to be bothered at all about what their customers are ingesting. I can’t count the number of times that our request for test results has elicited a response along the lines of “no-one else has asked” or “you're the only one with a problem”. These new untested shortfills took us back to how the e-liquid industry used to be pre-TPD when we faced extreme difficulty getting any kind of information about product content from manufacturers, and we had to run our own testing because we refuse to stock potentially unsafe liquids. The industry had been aware of the problem since Dr Farsalinos' 2014 report where he revealed he'd tested and found potentially harmful ingredients in a lot of e-liquids on the market. He tested for Diacetyl (2,3-Butanedione) and Acetyl Propionyl (2,3-Pentanedione) which are buttery/creamy flavoured chemicals which have been linked to permanent lung damage when inhaled. See his study report here. Consumers and manufacturers were starting to sit up and take notice. We put our cards on the table some years ago (when we were known as Cloud9Vaping) when we publicly blogged about our long-standing e-liquid testing policy (see our blog post here). We stated we'd removed a range of e-liquid from sale shortly after commencing stocking it, because our testing revealed that contrary to the manufacturer's own assertions, the liquids contained very high levels of these potentially harmful ingredients. Many customers asked us which range we had removed from sale, so eventually we revealed the full story which lead to a huge debacle much of which was publicly played out. The manufacturer then threatened us with legal action for revealing information that they already knew about, but had concealed from retailers and consumers. Gradually, the industry started to listen and vaping trade and consumer associations also started to recommend avoidance of liquids with these ingredients. Manufacturers started to actually recognise the problem and many began to take steps to deal with it and reformulate their liquids. The four ranges of shortfills we now stock have all been tested in exactly the same way as TPD compliant e-liquids, and none of them contain any of ingredients banned by the TPD, with the exception of Blackberry Crumble by Dinner Lady which contains a trace amount of naturally occurring (unavoidable) Diacetyl which is below the AFNOR recommended maximum level. It’s possible that the unregulated shortfill market will be shut down at some point in the future when the regulators take notice and close this loophole. We expect the authorities to mandate that they be tested in exactly the same way as any other e-liquid and we would welcome this change. We only have to hope that they don’t put the 10ml limit on these liquids as well – if they do, it will be entirely because of those who tried to avoid testing and are happy to supply unknown substances for unsuspecting consumers to ingest. We understand there is still some confusion about the EU Tobacco Products directive (TPD) which came into law across the EU on May 2016. The UK implementation is known as the Tobacco and Related Products Regulations 2016 (TRPR). It contains various restrictions and regulatory burden all of which will affect our customers to varying degrees. We’re currently in the transition period, and we can sell existing stock without restriction. This period ends on 19th May 2017, after which all products sold must meet the new requirements of the TRPR. Liquids without nicotine are exempt from these requirements. Maximum 10ml bottle size and maximum nicotine strength of 20mg/ml (2%). Maximum 2ml capacity for tanks, which must have a leak-free filling mechanism. A large warning about nicotine on the front and back of the packaging (even where the product is sold empty). Ingredients, composition and additional information and warnings to be on the outside of packaging and on enclosed leaflets. Products to be comprehensively tested (including their emissions during use) and the data notified to the governing body 6 months before products are placed on sale (or before November 20th 2016 for products already on the market). Sales of each notified product reported annually. Some of the products you rely on may change to a compliant format, but many will not, and will become unavailable for sale to consumers in the UK and EU. The substantial costs involved in the testing and notification will lead to a further reduction in the variety of products on the market as most manufacturers will only be able to afford to test and submit their best sellers. Prices may increase slightly to cover the costs of the testing and notification, as well as the additional packaging. We have been unable to import any non-compliant products since November 20th 2016, and so non-compliant products are beginning to sell out, and won’t be replenished. As you're browsing the website, you may notice a red box with the text "NOT PURCHASABLE IN THE EU AFTER MAY 19 This is your cue to buy now, whilst you still can, because you will not be able to purchase this product after this date. If you see this on a 30ml e-liquid, we recommend you browse the site to see if there is a 10ml compliant version available. We advise you to ensure you have stocks of your favourite products on hand well before May and transition to compliant products as soon as they become available. We have been concentrating our efforts and working hard with our manufacturers to prepare compliant items over the last 6 months and although there are huge challenges to overcome, we are hopeful about the future of vaping post-2017. For further information please see our earlier TPD blog post. UK Vapefest 2016 draws ever closer. It's a chance to catch up with all our friends, and have a lovely day out with fellow vapers. Make sure you enter the raffle for a chance to win the amazing prize below. Please contact us to let us know if you would like us to bring anything in particular with us. Vapefest Special Edition Dicodes No.6, SvoeMesto Kayfun 5, Efest 26650 battery x 2, Efest 26650 battery case, XTAR VC2 charger, UD Coil Mate Tool Kit, Fiber Freaks XL Pack Cotton Blend, Dicodes Resisterm NiFe30 Wire, UD 24ga (0.5mm) SS316L wire, 30ml Njoy Artist Collection 6mg/ml e-liquid x 5, Crème de Vape Microfibre pouches, Crème de Vape Vapebands, Mini screwdriver keyring, Keyring flashlight. Prizes are not refundable or exchangeable. Public Health England (PHE) have released some very welcome guidance about vaping policy in public and in the workplace. Their advice is measured and sensible throughout and they repeat that vaping carries a fraction of the risk of cigarettes and has the potential to help drive down smoking rates and improve public health but that policy makers must make clear the distinction between vaping and smoking. PHE is strong in its assertion that the estimated 2.8 million vapers in the UK need to be encouraged to stay smoke-free and that future policies about vaping in public should be focused on fostering an environment in which e-cigarettes can provide a route out of smoking for England's eight million smokers. There are many positive points within the guidance including a welcome acknowledgement that smokers can achieve their desired nicotine level much quicker than vapers, and this difference should be taken into account particularly in workplaces. "it is never acceptable to require vapers to share the same outdoor space with smokers. Where a designated outdoor smoking area has been provided in a public place or workplace, vapers should be allowed to vape elsewhere"
Links to all the documents can be found below. E-cigarettes in public places and workplaces: a 5-point guide to policy making. Use of e-cigarettes in public places and workplaces: advice to inform evidence-based policy making. In the House of Lords Lord Callanan has put down a motion which if passed would stop implementation of the TPD in the UK. This is a critical development. Lord Callanan is a hugely experienced senior politician. In the European Parliament he both advised how to campaign against medicalisation and led the successful campaign to block regulation that would have wiped out e-cigarettes. Nobody has been more effective at defending vaping than him. Unless Lord Callanan is forced by pressure from Downing Street to withdraw his motion there will be a debate and a vote. Under parliamentary rules if the Lords agree to this motion the statutory instrument implementing the TPD in the UK will fall. Such procedures are called “fatal motions” because the regulations get killed outright and do not go back to the Commons. The Lords are strongly against the TPD rules on vaping as was shown in last week’s debate in the House of Lords. They know there are severe problems with the TPD’s rules on vaping. Government officials have acknowledged that they could increase smoking and the health minister told the Lords that he hoped enforcement would be more ‘Italian’ than traditional British. The shadow minister said that he could not understand why e-cigarettes were included in the TPD and described opposition to vaping as “bonkers”. Two years ago his boss, Jeremy Corbyn, signed a parliamentary motion against the TPD rules on vaping. As politicians see increasing vaper pressure they are already trying to be creative in finding a solution. Technically the EU could start “infraction proceedings” against the UK for not fully implementing Article 20, but this would prove bad timing. This is not the time encourage anti-EU sentiment! In 2013, despite huge pressure from the EU commission, vaper power helped swing the day. At that time there were 1.3 million vapers in the UK. Now there are 2.8 million of us. Westminster and Brussels have reasons to be helpful. With top doctors such as the Royal College of Physicians coming out strongly in support of e-cigarettes, politicians are finally seeing the evidence that some of the rules are no longer fit for purpose. As we saw last week, a majority of vapers want to leave the EU. Politicians (at least those who are in favour of the UK remaining in the EU) will not want to see vapers decide their referendum votes on this single issue. If ever there was a day for vaper power this is it! Last time round, it was the letters and social media support that won so many MEPs to our cause. So let us respectfully urge our leaders to use the opportunity provided by Lord Callanan’s motion to rethink the specific problems we have with TPD. When vapers work together they are an unstoppable force. If we do not take today’s opportunity presented by Lord Callanan’s initiative then we could have to wait until around 2026 for the next Tobacco Products Directive to be implemented for even a chance of improvement. So wait ten years – or tweet today like you have never tweeted before. Thank you to Ian Gregory of Abzed for much of the content of this post. Last week we informed you about the Royal College of Physicians (RCP) report on electronic cigarette research, this week we are urging you to please write to your local MP asking them to support an early day motion calling for debate before the UK Parliment about the upcoming Tobacco Products Directive implementation on 20th of May this year. That this House agrees with the Royal College of Physicians that it is crucial that e-cigarettes are priced as advantageously as possible in relation to tobacco. Believes that the EU Tobacco Products Directive would significantly inhibit the development and use of harm-reduction products by smokers and cost lives. Further agrees with Public Health England that e-cigarettes are around 95 per cent less harmful than smoking, and that nearly half the population does not realise that e-cigarettes are much less harmful than smoking. Further believes that restricting advertising will have the perverse effect of reducing the rate at which cigarette use is declining. Notes that the total cost of smoking to society, including healthcare, social care, lost productivity, litter and fires, was conservatively estimated by Action on Smoking and Health to be around £14 billion per year. And calls on the Government to exclude e-cigarettes and other harm-reduction products from the Tobacco Products Directive. You can write to your local MP using this website: https://www.writetothem.com/ Please be polite and explain why you feel the TPD will impact your choices for vapour products, and how e-cigs have changed your life. You need to be sure to urge your MP to support the "Early Day Motion 1441"
If you have not read the Royal College of Physicians' report and shared it with your friends and family members, please do so. The report highlights what we as vapers have known all along, here are just a few of the key points of the full report. Smoking is the biggest avoidable cause of death and disability, and social inequality in health, in the UK. People smoke because they are addicted to nicotine, but are harmed by other constituents of tobacco smoke. E-cigarettes are proving much more popular than NRT as a substitute and competitor for tobacco cigarettes. There are concerns that e-cigarettes will “renormalise” smoking, but to date, there is no evidence of this occurring to any significant degree in the UK. In the interests of public health it is important to promote the use of e-cigarettes, NRT and other non-tobacco nicotine products as widely as possible. There is a need for regulation to reduce adverse effects of e-cig use but the regulation should not be allowed to significantly inhibit the development and use of harm-reduction products. It is excellent news that this comprehensive report fully recognises the importance of e-cigs as harm-reduction, however it may have come too late to prevent the damage that will be caused by the Tobacco Products directive coming into force next month, which will significantly inhibit the development and availability of these products. Be sure you have also read our blog post about the TPD (Tobacco Products Directive). We urge everyone to read the Royal College of Physicians' report and share it with your friends and family members. The report highlights what we as vapers have known all along, here are just a few of the key points of the full report. It is excellent news that this comprehensive report fully recognises the importance of e-cigs as harm-reduction, however it may have come too late to prevent the damage that will be caused by the Tobacco Products directive coming into force next month, which will significantly inhibit the development and availability of these products. Be sure you have also read our blog post about the TPD (Tobacco Products Directive). You may have heard rumours about upcoming regulations which will affect the availability of many of the vaping products you currently enjoy. We’ve been hesitant to communicate much of this information directly to our customers thus far, because the situation has not been clear enough to be able to properly inform you about exactly what will happen. Information directly from UK regulators has slowly started to come through but there’s still grey areas and ambiguity in the information released so far, so it’s still quite difficult for companies to plan properly or advise their customers on what the future holds. Having said that, we know a large proportion of our customers still don’t know anything about these looming changes and we felt it was time to give you a run-down of what we know so far as well as comment on what we don’t yet know. Apologies that this is quite a long post, but it’s a complex topic, and requires as much explanation as we can provide to ensure you are as well-informed as you possibly can be. On May 20th 2016 The EU Directive 2014/40/EU1 also known as The Tobacco Products Directive (TPD) comes into force. This Directive changes how tobacco and related products are manufactured, marketed and sold within the EU and contains some very restrictive measures relating to vaping products2. Many feel (us included) that the restrictions relating to electronic cigarettes didn’t belong within a directive relating to tobacco products at all, and that regulatory provisions for these innovative, and life-changing products belong in separate, more carefully considered legislation, which could have ensured vapers continued to have access to the products they need and the right to choose a much safer alternative to smoking. However, the directive as it is was pushed through to further regulate cigarettes, tobacco products, and vaping products, all in one go. As a result of this legislation, many of the products we know and love will disappear and the products currently available on the market will become very limited. The rate of innovation will also slow due to the financial burdens and delay involved in bringing new products to market, compounded by the 6 month delay that’s been imposed for newly notified products. The regulations do however allow a sell-through period3 for the sale of old stock until May 2017. Unfortunately, there’s still a LOT up in the air due to the regulators’ failure to unambiguously define what’s included and what isn’t as well as the fact they have repeatedly contradicted themselves on various documents we’ve seen. This uncertainty means that much misinformation is out there, and manufacturers and retailers are not yet able to state exactly what the position will be, even though the restrictions will take effect in just a few months’ time. We’ve chosen to focus here on those elements of the legislation that will be most restrictive for existing vapers, however there are various other provisions that will dramatically affect vaping. One that is of great concern to those of us who are keen to spread the message of vaping to as many smokers as possible is the ban on all forms of advertising and promotional activity, which may include online discussion forums and specialist vaping broadcast channels as well as traditional print and TV/radio media. Please rest assured that we’re doing our absolute best to navigate our way through the legislation, and working with our manufacturers to ensure they are also up to speed, and capable of producing compliant products. However, these changes ARE coming, and all current and future vapers will be radically affected. Read on for detailed information on some of the restrictions the TPD will impose. We will continue to update you as we obtain more clarity. This is clearly going to be a major problem for all sorts of reasons, not least because it makes it a much more expensive and inconvenient way to purchase and store e-liquid since it’s customary for many vapers to use 5 or 10ml or even more, per day. It’s completely at odds with regulators’ desire to reduce waste and promote a green agenda in every other area of our lives. Some commentators have indicated they suspect this size limit is so the products can be very easily taxed per bottle at a later date although the regulators state that this limit was set with user safety in mind, to reduce the possibility of serious effect should someone accidentally or purposefully drink a bottle of e-liquid. We find it strange that the same type of restriction has not been applied to other readily available products that could be equally or much more dangerous than e-liquid if ingested orally. No-one’s ever seen fit to limit purchases of bleach to a thimbleful or limit the maximum bottle size for alcoholic spirits to the equivalent of a couple of units worth. It’s even more nonsensical when you consider that this very same TPD legislation has done the exact opposite of this restriction for cigarettes, in banning their sale in packs of fewer than 20 cigarettes to make them less appealing and less affordable to children. This maximum bottle size issue is further compounded by the fact that buy-one-get-one-free and some other types of price promotion offers will be banned although it’s not clear whether the restrictions on price promotions will be imposed immediately or at the end of the sell-through period3. You will no longer be able to legally purchase nicotine containing liquid in bottles larger than 10ml in any EU member state once the sell-through period3 is over. Research studies4 have found that vaping is actually less effective at delivering nicotine than smoking, and vapers ingest less nicotine from vaping than smoking. Many indicators (and our own experience) tell us that a higher strength liquid is often needed by some users in their first attempts to make a complete switch away from smoking. We believe most of our customers who currently vape 24mg/ml will be able to reduce to 18mg/ml or 20mg/ml, but there does remain a core group of vapers who require strengths outside the typical range to keep them from going back to smoking and those vapers will need to reduce the strength they use and consider hardware changes that could make a lower strength liquid more satisfying. This restriction is again related to regulators’ misplaced concerns about accidental poisonings based on out-dated information about the lethal dose of nicotine due to dubious self-experiments in the nineteenth century5. There will be no such restriction placed on the nicotine level in products that are manufactured by pharmaceutical companies and approved under medicines legislation as a licensed medicinal product for smoking cessation, however, these will almost all be cigalike type devices with single-use/disposable high strength cartridges. You will longer be able to purchase non-pharmaceutical e-liquid higher than 20mg/ml nicotine (whether it’s pre-mixed, ready-to-vape or high strength liquid for DIY mixing) legally in any EU member state once the sell-through period3 is over. According to the EU directive, most of the current advanced tanks will be banned outright. However, according to the UK draft legislation, it appears that this restriction may only apply to tanks that contain e-liquid at time of sale. It’s also not entirely clear as to whether this includes rebuildables or replacement heads and coils but the most recent communications from the UK government appear to indicate it includes anything which could contain nicotine in the form of e-liquid which is intended to be vaporised and inhaled. Most of the tanks we currently stock and similar ones in the near future may not be allowed under the new rules, and those few that do meet the restrictions may not be saleable unless they have been tested and a full dossier provided to the MHRA 6 months in advance of them being placed on sale3 (or by November 2016 if they are already on sale). If you currently prefer tanks larger than 2ml, you may not be able to purchase them legally in any EU member state once the sell-through period3 is over. We await some further clarification of exactly how this restriction will be applied in the real world. The regulators have not yet fully defined what they mean here, and there’s been some discussion about whether or not the regulators might require some sort of e-liquid bottle docking system – which would obviously mean consumers will be “locked-in” to different types of proprietary refilling mechanisms and thus limited to which brand of liquids could be used with certain brands of tanks. It is hoped that the definition will be more related to the size and length of the tip on bottles, and the filling hole size on tanks. We await further information on how/what this requirement will mean in the real world. Every user has a different vaping style and so everyone’s “puff duration” and pressure differs. Added to that, modern devices allow you to tailor the experience to your preferences with most advanced devices currently available featuring adjustability in wattage or voltage, and airflow. Defining “normal use” is therefore very challenging and indeed no interpretation or specification has been given. It looks like each manufacturer will be required to formulate their own dosage testing protocol and demonstrate that the amount of nicotine delivered is consistent and repeatable using this standard protocol. We await further information on what this requirement will mean in the real world. A list of all ingredients contained in the liquid and contained in the vapour produced. Toxicological data for all those ingredients within both the liquid and the vapour. Information on nicotine doses and uptake for the product. Full description of all components of the product including where applicable, the opening and refill mechanism of the product. A description of the production process and a declaration of conformity with the requirements of the directive. Annual sales volume reporting across the notified products including geographical information and preferences of various consumer groups. There will obviously be huge financial implications involved in the testing and notification process, which has been based on a pharmaceutical model despite the fact that these products are not pharmaceutical or healthcare products, and indeed retailers will still not be allowed to present them as such, or make any claims as to their effectiveness as a quit-smoking method. It would have been sensible for regulations to require testing and identification of known potentially harmful inhalant risks, but the regulators have seen fit to demand the entire recipe for all liquids, thus forcing manufacturers to disclose proprietary formulations which are essentially, trade secrets. Food flavouring manufacturers aren’t currently required to divulge their entire recipes and can retain some commercial confidentiality to prevent formulations being stolen or copied by competitors. This makes it extremely difficult to identify compounds present because chemical analysis is performed by looking for specific ingredients. Without having knowledge of what one’s looking for, analysis is almost impossible. Even where the compounds are identified by the flavouring manufacturer, e-liquid manufacturers will still need to run chemical analysis on every single iteration of their product (that’s every strength and flavour separately) to identify and quantify all the compounds present, both in the liquid, and in the vapour. Cost estimates vary wildly, depending on who you speak to, but a very conservative estimate is a minimum of £5000 per iteration (e.g. a banana flavour e-liquid in 4 strengths = a minimum of £20,000 just for the testing and documentation for that one flavour liquid). There are also the initial notification and annual renewal fees to factor in as well as the huge administrative burden. The resulting impact of these provisions is not yet known because e-liquid is currently available in the UK in thousands of flavour and strength combinations, all of which will be unsaleable unless they have been tested and notified. Very few manufacturers outside the EU will comply with these reporting requirements, so it will be up to the retailer to undertake the testing and notification and bear the cost. This is unlikely to happen in many cases, so many non-EU products will simply disappear from the shelves. EU manufacturers and retailers who can’t afford to test and prepare notification for hundreds of different products will likely close their business, or radically cull their ranges. Once manufacturers do take note and make provisions to adhere to the new testing and notification requirements, they will not be able to place products on sale until 6 months after they make their product notification submission to the MHRA. Expect to see a massive reduction in the e-liquid choices available on the EU market once the sell-through period3 is over and a delay on new products coming to market. Also expect e-liquid prices to increase. A list of all ingredients contained in the product in descending order of the weight including the nicotine content of the product. An indication of the nicotine delivery per dose. A recommendation to keep the product out of reach of children. The warning “This product contains nicotine which is a highly addictive substance. It is not recommended for use by non-smokers”. Instructions for use and storage of the product, including a reference that the product is not recommended for use by young people and non-smokers. Warnings for specific risk groups. Possible adverse effects; Addictiveness and toxicity. Contact details of the manufacturer or importer and a legal or natural contact person within the EU. A fold-out information leaflet attached to the bottle may be acceptable in place of a box with leaflet enclosure. Technically, there isn’t a definition for what a “dose” is as it relates to vaping because we ALL vape completely differently. Every vaper decides for themselves what strength they use, and how much they vape so this requirement could be slightly challenging. There are concerns over possible liability issues where the product packaging contains contraindications, and warnings for specific groups (whilst omitting other specific groups) and indeed this requirement is going to be a challenging one for all non-pharmaceutical companies due to the limitations of general product liability insurance. Most current retailers don’t even have sufficient product liability insurance now due to its cost, and it’s highly unlikely any small-medium retailer could afford sufficient insurance for products where health warning information is contained on their products. Along with the reduction in choice, you can also expect to see a much higher cost for e-liquid, that has been tested, notified, and packaged in accordance with the regulations. Other repercussions such as product liability insurance issues are unclear. 20 May 2016 - New regulations apply for new products brought onto the market after this date. 20 Nov 2016 - Deadline for manufacturers and importers to submit data on ingredients and emissions for existing products; and manufacturers and importers of e-cigarettes to notify existing products on the market (if they intend to continue selling them after May 2017). 20 May 2017 - Date by which sell-through period for existing stock of non-compliant products purchased before November 20th 2016 ends. Write to your MP. It's too late to change the TPD, but the implementation and enforcement strategy is not yet set in stone. On 1st October 2015, it became a criminal offence to supply nicotine containing e-cigs to persons under the age of 18. We've always taken a firm position in this regard, however, as a result of this new legislation, we have implemented further steps to ensure sales to minors are prevented. These steps include requiring you to register for a customer account to shop on the site. We appreciate this may not feel as convenient as before, but we've decided it is the optimal solution to this new legislation. We're thrilled to inform you that Cloud9Vaping will now be known as Crème de Vape. The great products, super-swift service and amazing customer support you've come to know and love, will remain - all wrapped up in a newer, classier package. No need to change your login details or passwords, all your details have been brought across to the new site. The old Cloud9 web address will continue to work, but we'd recommend updating your bookmarks to www.cremedevape.com. The original content of the post, dated 28th June 2015 and entitled Liquid test results, was a table of test results of liquids supplied by Five Pawns (as well as other suppliers) and an explanation of those test results. They declined to provide their own test results when we commenced trading at the start of 2015, accordingly (and in accordance with our product testing policy) we submitted 8 Five Pawns liquids to testing at an independent UKAS accredited laboratory. We published the results approximately 7 weeks after providing them privately to Five Pawns. Five Pawns took exception to the post, sent a cease and desist letter through their attorneys, threatening legal action if our post was not removed. Whilst we stand by these results, we decided to take down the information to comply with Five Pawns’ request. Our own solicitors have responded in robust terms rejecting allegations made by Five Pawns, and they have now released their own test results, and it is incontrovertible that liquid produced by Five Pawns contains the compounds in question. The information relating to specific products withdrawn from sale as part of our testing/due diligence processes has been removed pending legal advice. Latest test results on our own brand liquid are now available. 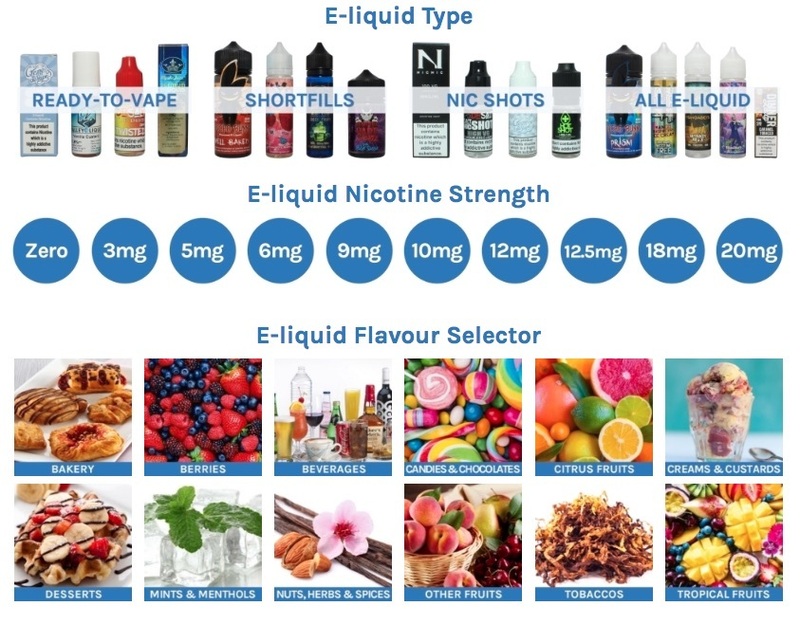 There's been a lot of discussion and debate about dangerous compounds that have been found in many flavoured e-liquids and food flavourings used in e-liquid production. We felt it was about time to give a thorough explanation of exactly what we do, so that you can rest assured, we're taking every step we possibly can to provide as safe a product as possible, according to the current known risks. We've been testing our products since 2011 at the same independant UK-based laboratory used by Trading Standards. The lab is accredited by the United Kingdom Accreditation service (UKAS) to the internationally recognised ISO 17025 standard which means they have demonstrated they are technically competant and have documented procedures and quality management systems in place to ensure they are producing precise, accurate and repeatable test data. This accreditation also means they are continually monitored and audited to ensure their procedures and methods continue to consistently provide accurate and valid results that can be trusted by governmental organisations and compared to test data produced by other accredited labs worldwide. We don't generally publish our results alongside the liquids, because we anonymise the samples for company confidentiality. This "blind testing" policy is common in many industries, and was introduced to us by ECITA when we first began testing. This method wasn't an issue when we were simply running tests for our own internal due diligence. However, it has caused us to be unable to properly publish all of our own test results alongside the products on our site so we will be changing this policy in the future so we can publish all our test results with the product clearly identified. Diethylene glycol (DEG) is a known contaminant that is often present in general reagent grade Glycerine that's not designed for ingestion or pharmaceutical use. Some research was released in 2009, claiming that the FDA sampled several pre-filled cartridges and found Diethylene Glycol (a poison) present. It's imperative that these compounds aren't contained in products designed for ingestion, although not much notice is given to this within our industry. We have historically tested all our liquids for both DEG and Ethylene Glycol to verify the purity of the diluents used in the product, and to-date, none of our pre-mixed e-liquids have ever tested positive for either of these compounds. We are proposing dropping this test from our protocol as we're confidentn our manufacturer's protocols eliminate all risks in this area. As nicotine can be dangerous in high doses, we feel it's prudent to test the actual nicotine level, in random e-liquid samples, both to confirm that it is within tolerance of the stated level, and to confirm it isn't present in liquids that are labelled zero nicotine. It has been our experience that some tobacco type flavour zero nicotine liquids can contain miniscule traces of nicotine, due to to the method of production involved in manufacturing some tobacco flavours, however, we have never seen any results above 0.04% nicotine (0.4mg/ml) in a zero nicotine e-liquid, and any product that tested above 0.02% (0.2mg/ml) would not be released for sale. The last time any of our zero liquids tested positive for traces of nicotine (at 0.01%) was in January 2013. We run these tests primarily to ensure any product we advertise as "PG Free" is in fact completely free of PG, since these products will typically be chosen by consumers who have an allergy or an intolerance to Propylene Glycol. We also like to see the PG/VG ratios for our own consistency checks and so we can advise customers who have a particular PG/VG ratio preference. All flavourings used in our pre-mixed liquids, and available as concentrates for DIY mixing have been certified as safe for use in consumption via the digestive system - i.e. they are food-safe. However, this is not the whole story, since ingestion into the lungs via vapour is an entirely different pathway, and some flavourings that are completely safe to be eaten, are not safe to be vaped. There are a family of compounds referred to as diketones, that pose some serious inhalation risks and should not be present in e-liquid. These compounds are used to provide a buttery/custard/vanilla type flavour and are currently found in many pre-mixed e- liquid ranges, particularly the more complex blends coming from the USA at the moment. The diketones of particular concern are Diacetyl (2,3-butanedione or DA) and 2,3-Pentanedione (Acetyl Propionyl or AP). We also test for the presence of Acetoin, which by itself, is not known to be harmful, but it can partially catalyse into DA under certain conditions, so we do test for acetoin, so that we are aware of the level, if present. Diacetyl (DA) in its inhaled form, has been identified as the major cause of a serious lung condition observed amongst a group of popcorn factory workers exposed to large amounts of fumes containing DA in an industrial environment over an extended period of time. As yet, no tests have been performed on human inhalation via vaporisation of flavoured e-liquid, however, there is a published occupational safety limit of 66µg (66 parts per million), which means, if you vape 1ml of e-liquid, it must have less than 66µg or 0.0066% DA to be below the occupational safety limit. Our current testing is able to detect DA to 10 parts per million or 0.001%. None of our e-liquids or flavouings contain DA as a specific ingredient, and where we have identified it during testing, we have refused to stock the product or withdrawn it from sale if it was already on sale prior to receving DA-positive test results. The dangers associated with inhaling DA have been known for some years, and we've been testing for the its presence since 2011, however, it was only in 2014 when Dr Farsalinos released the results of his research, that the industry realised flavouring manufacturers who were responding to the "noise" regarding Diacetyl, had been replacing it with Acetyl Propionyl (AP), and that AP has very similar inhalation risks and is not suitable for vaping either. Prior to this research, many vendors, including ourselves, were unaware that AP also posed a very real risk, and since this point, we have also included it in our testing protocol. The published occupational safety limit of AP is 135µg (135 parts per million), which means if you vape 1ml of e-liquid, it must have less than 135µg or 0.0135% AP in it to be below the occupational safety limit. Our current testing is able to detect AP to 10 parts per million or 0.001%. As of the date of this article, we do not stock any pre-mixed e-liquids that have tested positive for DA or AP at any level. We may take the view in future, that some consumers want these types of flavours, and we may decide to stock e-liquid that has tested positive for DA at a very low level, as it occurs naturally in some flavours. If we did this, we would impose a limit ourselves, of approximately 25 parts per million (0.0025%). If we stock any e-liquids in future that do contain traces of DA up to 25 parts per million (0.0025%) we will clearly indicate this information. Where our testing identifies an e-liquid contains DA above 25 parts per million (0.0025%), we will still continue to refuse to stock it. We are unlikely to alter our position on AP, since it never occurs naturally and is only present when it has been physically added. We do also use the same testing protocol (excluding nicotine assay) on specific flavour concentrates where we believe, by virtue of their flavour profile, could contain harmful diketones. None of our concentrates have ever tested positive for Diacetyl, but some do contain AP in very low quantities. Where concentrated flavourings are concerned, assuming the concentrate is used at 10% and 5ml per day is vaped, our own self-imposed limit would translate to 250 parts per million (0.025%). We will not stock any new flavour concentrates that exceed this level, and those we currently stock that could exceed this level are clearly identified in our flavour concentrates product information download. It should be noted that where a liquid has a buttery or custardy taste, but has tested free of DA or AP, the buttery note will have been achieved by Acetoin or Butyric acid, or a combination of these components. Butyric acid can cause irritation in some vapers and it can also be responsible for an unpleasant sour after-taste in certain concentrations or flavour combinations. The amount of liquid you vape per day may exceed averages, thus exposing you to more risk, and indeed, if you are at all concerned about diketones, or other as-yet unidentified, potentially harmful component, we advise you steer clear of all buttery, custardy, vanilla, creamy & sweet flavours or consider vaping subtly flavoured, or even unflavoured liquids, rather than strongly flavoured recipes with many flavouring components present, in high concentrations. Additionally, it should be remembered that vaping is a "reduced-harm" alternative to smoking - this doesn't mean it's completely harmless but that it's known to be much less harmful than smoking traditional combustible tobacco. The fact that liquids have tested free of these known risks, is not an indication that any one flavouring is more or less "safe" than any other - no long term or comprehensive studies have yet been performed on human inhalation of vaporised food flavourings. In the recent past, we removed a well-known premium e-liquid range from sale because our test results indicated very high levels of DA (testing showed up to 100 ppm or 0.01%), and extremely high levels of AP (testing showed up to 2500 ppm or 0.25%). We trusted the manufacturer were doing their own due diligence but this experience was a reminder that there are no shortcuts. We are not prepared to take risks with your health and our company reputation, and will not stock any new liquid products until the supplier has provided comprehensive analysis performed by a known, accredited & independent laboratory, or we have performed our own analysis. One of the great features of the YiHi SX Mini M-Class is that its firmware can be upgraded by the owner. In this video, Phil Busardo takes you through the process of updating the YiHi SX Mini M-Class to the latest firmware. We're extremely proud to have been nominated and to have come top in three categories again in the 2014 UK Vapers awards. Winning these awards 2 years running is an amazing achievement and we'd like to extend enormous thanks to all those who voted and to all our customers for making 2014 another amazing, award winning year! ​Note: We were formerly known as Cloud9Vaping and rebranded as Creme de Vape in 2015. Electrical Safety First have asked us to support their campaign to raise awareness about the dangers of purchasing cheap and untested e-cig equipment. We take the subject of electrical safety very seriously, and it's always worth reminding vapers to buy high quality branded equipment from reputable retailers and learn how use it safely. Please visit the Electrical Safety First website for more information. We're extremely proud to have been nominated and to have come top in 3 categories again in the 2014 EcigClick awards. Enormous thanks to all who voted and to all our customers for making 2014 another award winning year. Non-authorised copies and counterfeits are a major problem across all product sectors, but have really got out of control in recent months within the electronic cigarette industry. As a fairly young industry, with many unique brands entering the market each week it’s a very difficult problem to solve, although we have already begun to hear stories of original manufacturers fighting back hard, getting shipments seized and destroyed at the border and getting the PayPal accounts of the dealers of these illegal goods frozen. We can only hope this will become a more common occurrence. Counterfeits and clones, what’s the difference? A counterfeit product has every element of the product copied, including the original maker’s marks and logos, or can be a slightly or entirely differently designed product, featuring a known manufacturer’s logo or marks so as to make it appear as if it is made by the manufacturer who owns the logo. Often, the consumer will not have any idea they are purchasing a counterfeit product, and sometimes, even the retailer will have been duped by their supplier too. Cloning is where most elements of the product have been copied, but the product is intended to be identified and sold as a copy, and doesn’t feature the logo or marks of the original manufacturer. Although it has very serious effects on the designer/manufacturer of the original product, as well as its entire distribution network, it’s harder to prevent because the process of proving intellectual property of designs is harder and very costly, even when a patent is owned. Essentially, whether you call them counterfeits, copies or clones, they are all theft of original work and made using the intellectual effort and resources of the original innovators. A bargain, or is it? You might not regard buying a counterfeit mod or atomiser as an illegal transaction, but merely a cheaper way to get the latest device everyone’s talking about. Often the temptation for consumers can be too strong to resist, with many not understanding the very real risks and ramifications attached to this illicit industry. Besides the very obvious quality issues usually found on counterfeit and clone products, which at their very least, often lead to user experience issues because of poor performance or defective operation, or their visual appearance or “finish” being below par, there is a much more worrying safety concern with these fake products. The safety of a product can be impacted by means of dangerous materials finding their way into the finished products (for example, high levels of lead in cheaper metal alloys) or worse, major electrical faults which could lead to very dangerous explosions and fires despite the user ensuring they observe all the normal safety measures. I can’t afford genuine products, what’s the harm in buying a clone? Many consumers, particularly in our market, seem very happy to knowingly purchase knock-off goods. Maybe this is because of limited funds, or simply because they can’t justify paying the full price for the equipment they so desperately want to acquire. There is an element that even believes the original product is “so expensive that it deserves to be cloned”. If you are one of those that think like this, I ask you to stop right there and think a little more deeply about the costs. Imagine for a moment that you spent time and money coming up with a great piece of work, or a product, would you be happy to have invested hours and hours of your time, perhaps time you’d have rather spent with your family, and borrowed or invested thousands of pounds in your idea, only to have someone come along as soon as you release it, and copy it for their own gain and thereby halt any hope of you recouping your original costs? If you believe you yourself deserve to be rewarded properly for your own talents and effort, and you appreciate the talent and the work of one of the many wonderful and talented manufacturers in our industry, surely you believe they should also be rewarded properly for their work, rather than the efforts and toil being “used” by someone else for material gain? Consumers also need to be aware that the type of companies engaging in counterfeiting practices will have no concern about the safety of the products, or the safety of their manufacturing processes, and are often engaged in organised crime and/or using child labour to keep their costs as low as possible. Counterfeit products lead directly to financial turmoil for businesses such as low turnover, stolen know-how, lost jobs, lawsuits and price hikes, followed by growth halt & innovation slowing. The original manufacturer relies on the sales of their original product to pay them back for all their time and investment in the original design, prototype production, manufacturing costs and testing phases involved in bringing a new product to market, as well as requiring the funds to help toward future research and innovation. The inevitable drop in sales of the legitimate product means these original manufacturing costs may never be fully recovered, or that limited funds remain for further research, innovation and development. Authorised retailers of a product which has been cloned or faked may find themselves completely unable to sell the original products they have on hand, or only able to sell them at a loss. Without going into great detail here about stock management or the cash conversion cycle, having funds tied-up in un-saleable stock is a massive drain on a businesses’ resources, both in terms of the funds not being available to pay employees or purchase other stock to maintain profitability, and also in terms of the space and resources used by such product whilst it remains sitting in the warehouse. Also consider the negative impression a poorly performing counterfeit product leads to in the mind of the consumer, who may have no idea it’s not a genuine product. As the saying goes, “mud sticks” and the negative experience will forever be associated with that of the original manufacturer in the mind of the consumer. The ramifications of counterfeiting aren’t just limited to those involved in the trade – it actually affects everyone in an economy affected by the activity, with Governments, businesses and society being robbed of tax revenue, business income and jobs. The flood of counterfeit products leads to more public spending through the requirements for increased border efforts to spot, and seize the fakes as they are imported, increased Trading Standards’ resources and other enforcement work to counter the illicit trade. It also increases the burden on the government caused by unemployment and low pay (analysis has been performed which indicates 300,000 jobs have been lost in the EU wholly as a result of counterfeiting activity); and it increases the price of legitimate products as companies seek to recoup their losses. The effort of dealing with the problem, both in financial terms and also in the emotional toll it takes on original manufacturers and their authorised retailers, could mean that they simply lose hope for the industry they love being a part of, and give up and go and do something else instead. There is a great need, particularly within our industry, to build more awareness of the scale and effects of the problem. Border controls, Trading Standards, merchant payment processors, sales sites (such as eBay and Amazon), Official Trade Bodies and forum owners all need to take a much tougher stand against counterfeiters, and although the responsibility falls on everyone, the greatest change can be brought about by consumers themselves who can to exert their influence with their purchasing choices. While consumers often cannot identify counterfeit goods, the more obvious routes of supply should be shunned and companies engaging in this trade should be named and shamed. You can avoid contributing to this problem by only going to well-known and respected authorised dealers, and if you are in any doubt, try to contact the original manufacturer and ask them if the supplier you’re about to purchase from is an authorised one. It’s understood that you may find fakes at your local market, but also be aware that they are often sold on professional looking websites. Stay alert to warning signs. If the product is being sold by someone other than an authorised retailer, steer clear. If the price is too good to be true, then it probably is. The bottom line is that counterfeiting costs everyone, and those too concerned with paying the cheapest price for their vaping kit, when they should be focused on the harmful effects that these cheaply made counterfeits could have, are the primary drivers for the rampant counterfeiting within our industry. If people refuse to purchase knock-off products, these rogue industries will suffer economically and ultimately disappear. Vapefest 2014 promises to be bigger and better than ever before. As ever, it's a fabulous opportunity to meet up with fellow vapers and catch up with old friends. We'll be donating some wonderful raffle prizes, so do be sure to enter, and don't forget to let us know if you would like us to bring anything in particular with us. We urge all vapers and their family and friends to support the European Free Vaping Initiative. On the 26th of February the European Parliament moved closer to ratifying the Article on electronic cigarettes within the Tobacco Products Directive. This controversial, rushed and unacceptable legislation born of ignorance and in complete absence of scientific evidence, endangers the future of vaping across Europe, putting the health of millions of current and potential future vapers at risk. The list of the problems with this new regulation is practically endless but put in a nutshell, it will lead to most of the products you currently use being banned. Yes that's right, banned! Whilst they've tried hard to make the new legislation sound completely reasonable and in your benefit, what it will actually do is regulate all of the most effective and innovative vaping products out of existence including cartomisers you can open or refill, tank atomisers that hold more than 2ml of liquid, all rebuildable atomisers, bottles of e-liquid larger than 10ml and all e-liquid with more than 2% nicotine. Basically everything we all use on a daily basis. The European Free Vaping Initiative has been set up to use the mechanism by which EU citizens can express their common opinion on how the European Parliament should approach certain subjects, in this case vaping. It's not too late to save vaping, but it is essential that every vaper, and all their friends and family members ACT NOW. Over one million signatures of support must be collected from all across Europe so that the decision makers can no longer continue to ignore us and regulate our products out of existence. Please, please support this initiative, and also get all your family and friends to support too. We're extremely proud to have been nominated and to have come top in three categories in the 2013 UK Vapers awards. Enormous thanks to all who voted and to all our customers for making 2013 an award winning year. We're extremely proud to have been nominated and to have come top in 2 categories in the 2013 EcigClick awards. Note: We were formerly known as Cloud9Vaping and rebranded as Creme de Vape in 2015. We have increasingly been receiving emails from our customers who use gmail asking why their order hasn't been dispatched, or asking where their tracking number is. In all cases, their orders have been dispatched many days before they contact us, and they have received all this information already, but gmail has incorrectly filtered it into their spam folder. We simply aren't able to answer 40-50 emails (sometimes more) per day on this topic any more. We ask you to PLEASE check your spam folder for your dispatch notification and tracking number BEFORE contacting us to request it. When you find any of our emails in your spam folder, please mark them NOT spam, and please add us to your whitelist. Alternatively, choose a different provider that doesn't control what you want to read in your email. You may have heard that the Medicines and Health Regulatory Agency (MHRA) intend to regulate e-cigs as medicinal products within the UK. This is coupled with the EU parliament heading in the same utterly unworkable direction. E-cigs are not medical devices, and nor were they ever intended to be. They are already very well regulated under the general product safety regulations framework, if only Trading Standards departments would properly clamp down on rogue traders who supply electrical goods that fall foul of British and European standards, and refuse to test their e-liquid or even label it properly and legally. The MHRA have made all sorts of unjustifiable claims that regulating these devices as medicinal devices will make them safer and more effective. There hasn't been one single death attributed to e-cigarette usage, yet in the UK alone, 100,000 people die every year because of smoking. You can attest to how safe and effective you've found vaping to be. In reality, the continuous pushing to shoe-horn these non-medicinal devices into medicines regulation is nothing about safety, harm-reduction or saving lives, and everything about those that make these decisions on your behalf receiving poor advice and making uneducated assumptions, and facing enormous pressure from both the pharmaceutical industry and the tobacco industry, both of whom are already losing revenue as more and more smokers make the switch to vaping. If these proposals are forced through, vaping as we know it will die, all the wide variety of devices, atomisers, tanks, cartomisers, liquids and other amazingly wonderful products will be gone. In their place will be a small handful of ineffective, disposable type e-cigs from large pharmaceutical and tobacco companies. Think cig-a-like devices, with measured "doses" of liquid available in one or two flavours and useless for anyone but the very lightest occasional vaper. We vapers are facing a war, fighting for our right to enjoy our e-cigs as a recreational alternative to traditional tobacco smoking. It needs all of us to do our bit. Ask for an e-cigs save lives sticker when you place your next order, and display it on your car, shop window, or indeed anywhere it will be seen - request extras for family and friends too. Print out copies of the E-cigs Save Lives Flyer and distribute them as widely as you possibly can. Your workplace, your local shops, bars and restaurants, anywhere you can to help get the message across. Write to your MP and to your MEP, ask what they know about e-cigs, tell them what vaping means to you, and how limiting access to the myriad of different devices will impact you. There's over one million vapers in the UK now, and it needs every single one of us to make our voice heard to protect our vaping way of life. For those customers who have seen and heard the news reports today regarding the MHRA's announcement about their intention to regulate electronic cigarettes as medicines. Many are emailing us to ask whether we will obtain a medicine licence or will we close. Forcing our products to be licenced as medicinal devices is incorrect application of the medicines licensing framework, unethical and most likely illegal, given that traditional cigarettes are allowed to be sold freely to over 18s, and we are not making any claims as to a curative or medicinal effect or treatment for any disease. The MHRA decision will be challenged, we're not going anywhere, and will not be applying for a medicinal licence for any of our recreational products. We do still urge all e-cig users to contact their local Members of Parliament and Members of the European Parliament to express their views about what restricting their access to these devices only in pre-packaged, "medically approved" format, from only pharmaceutically licenced vendors will mean to them and their new, improved way of life. Please participate in the largest ever survey on e-cigarettes. Dr Farsalinos and his co-workers at the Onassis Cardiac Surgery Centre in Athens, Greece have launched the biggest survey of its kind on e-cigarette use. The survey will collate a lot of useful data on exactly how and why we use our e-cigs, and hopefully, some ammunition in the fight against bans or inappropriate legislation that could remove our choice to vape. The survey is available in six languages, and although contributions are welcomed in order to help fund the research, you can participate without making one. Please visit http://www.ecigarette-research.com/web/index.php/component/content/article?id=80 or click on the logo above. Thank you for participating in this important work. Call to arms - why ALL vapers MUST act now! Would you be affected if you could no longer easily buy your vaping supplies? What about if all you could get was e-liquid containing a paltry 4mg/0.4% nicotine? How would you feel about all the smokers who never got to experience the new way of life that you are currently enjoying? Upset? Depressed? Enraged? This article has been reproduced in its entirety from Clive Bate's blog because it gives you all the information you need to know and how to help do something about it to protect our vaping way of life. On 19th December 2012, the EU produced a a proposal for new laws controlling tobacco and nicotine products like e-cigarettes. The proposal includes a justification for the measures with draft legal text and comes with supporting documentation. It covers a wide range of issues, including: labelling and warnings on cigarette packs; branding restrictions; control of flavours and additives; tracking and tracing to prevent smuggling and counterfeiting; and measures that apply to smokeless tobacco products and nicotine-containing products like e-cigarettes. The proposed directive contains measures that make it harder or impossible for smokers to switch from cigarettes to much less dangerous nicotine products – an approach that will cause much more death and disease than it prevents. If you smoke, use e-cigarettes, or if have friends or relatives that smoke, or if you are concerned about the health damage from smoking, then this directive matters to you. If you want to write to your MP or MEPs, the main information you need together with my advice is set out below. More detailed briefing on the directive is available here and on influencing the scrutiny process is here. A good political article on the directive here. A good background video on tobacco harm reduction here. 2. Why do you need to act? 1. Bans the safest tobacco products. It bans the least hazardous form of tobacco known to mankind – snus – whilst allowing cigarettes to be widely sold. Snus (or oral tobacco) is much less dangerous than cigarettes, and widely used in Sweden, where it is the main reason why Sweden has much lower rates of cancer and other smoking-related disease than anywhere else in Europe. greatly close down competition, limit innovation, raise costs leaving the market to big players, such as tobacco or pharma companies, that can cope with the huge burdens that comes with medicines regulation. The directive treats e-cigarettes below a certain threshold as consumer products. The very weakest form of e-cigarettes (with liquids below threshold of nicotine density 4mg/ml) might escape medicines regulation. But these are extremely weak in e-cigarette terms, and not regarded as adequate substitutes for conventional cigarettes and unlikely to do much to help people switch from smoking. More on this in my briefing on the directive. It denies consumers the most relevant information about lower risk tobacco products – information they could use to reduce their own risk and protect their health This is misleading by omitting the most important information. Yes it does – the health of real people is at stake. Smoking already kills 700,000 and costs €25 billion in health care costs in Europe annually (about 100,000 and £3.7 billion for the UK) [source]. Quit rates remain stubbornly low despite years of effort and drug development – and 28% of European adults still smoke (about 21% in the UK) despite almost universal knowledge of the dangers. Most smokers say they would like to quit and most say they wish they had never started. Some like a nicotine hit and some of the ritual that goes with smoking, but we know that if safer alternatives can be found people will use them them. There is a grave danger that people denied much safer alternatives will either lapse back to smoking or never be able to try these ways of giving up smoking. I have never seen a directive where the evidence so clearly points to it causing more death and disease – it is reckless, irresponsible, unscientific and unethical. Your Member of Parliament (MP) represents you in the UK, and several Members of the European Parliament represent you in matters to do with the European Parliament. Both MPs and MEPs have a role to play on the tobacco directive, so it is best to to write to both. Your MP can approach UK government ministers and ask them to influence the directive as it passes through the European Council (comprised of ministers of the member states). Your MEPs can influence the European Parliament scrutiny of the directive, propose amendments and influence the stance taken by political groupings in the European Parliament. If they are members of the Environment, Public Health and Food Safety Committee, they will be involved more directly in scrutinising the directive. The simplest way to do this is to access www.writetothem.com. This is an excellent service: you enter your postcode; it works out who your MP and MEPs are (you will have several MEPs) then sets up e-mails for you to send them. You enter your own text and address details and then follow the procedure on the site and it will send your letter. Once you have drawn up a good letter that covers most of the points you want to get across you can use it for lots of different purposes – customising and personalising for each if you want to make an impact. For non-UK readers. For non-UK readers, I have less information – but all MEPs can be located here – and information on how different national parliaments scrutinise EU legislation can be found here. Your can follow many of the tips here and tailor for your national situation. Decent. Always be polite and dignified, don't make accusations or pre-judge their motives - most representatives want to do a good job for you. Engaging. Work on the basis that the MP or MEP is open-minded but might need some persuading. Don't dismiss other views, tackle them. Authentic. Write your own views in your own words - MPs and MEPs want to hear genuine heartfelt views, and not standard letters or borrowed text. Natural. Don't feel you need to use formal or legal language - it is their job to understand you, not your job to understand the technicalities of EU legislation. Concise. Concentrate on the things that really matter to you and stay focused - if you are writing about e-cigarettes, don’t dilute your message with views on other issues or even other aspects of the directive unless they really matter to you. Keep it short (max 2 pages or 800 words) and to the point. Personalised. Even though the web site allows you to send a single letter to all your MEPs in one go, I would advise emailing each individually. You an use the same basic text with each, but a little bit of a personal touch goes a long way. Relevant. Only write to your own MP or MEPs. It is important that you write in your own words, based on your own experience and express your own views. I must stress this – authenticity really matters. About you and your experience – eg. have you tried to quit smoking? What effect has vaping had on you? What experience have you had of e-cigarettes? What you think of the threshold e-liquids? Why you think what is proposed will be bad, especially if it is bad for you personally. You don’t need to use any or all of these, but they might help you construct a letter. Remember to personalise these to reflect your own situation where possible. The proposed directive seems to deny or obstruct smokers options to quit cigarettes by switching to nicotine or tobacco products that are much less risky. This is very risky and irresponsible, and will probably cause more death and disease. It looks like it is designed to tie up e-cigarettes and their makers in medical red tape, which could amount to banning them by the back door – and it makes no sense to ban them whilst leaving real cigarettes on the market. Even if medicines regulation doesn’t stop these products getting to the market, it may place restrictions on them making them less attractive, more expensive and less innovative – for example by banning flavours, making the packing look like medicines, and strictly limiting advertising and marketing. We don’t really know how medicines regulators will treat these these products. It could mean e-cigarettes are taken off the market while the makers apply for permission – there should be 2-3 years transition to give existing products time to comply with the directive. It is wrong to pretend that all tobacco and nicotine products are the same – smokers should have true and relevant information about risks so that they can make informed choices. 6.3 What should be done? These are a few suggestions from me.. please pick ones that matter to you, add your own views and use your own words. There should be no ban on oral tobacco (snus) – instead all smokeless tobacco should be regulated to reduce any toxic substances in the tobacco. This product is much safer than cigarettes and is a viable substitute for smoking. Smokers should not be denied this option. E-cigarettes should remain regulated for what they are – consumer products, placed on the market as alternatives to cigarettes. The appropriate regulatory regime is that used more generally for products – ’General Products Safety Regulation’, which is governed by an EU Directive and UK regulations. Only where an e-cigarette maker wants to make a health or ‘therapeutic claim’ should medicines regulation apply – otherwise treat it like a consumer product. If they don’t make a therapeutic claim, how can they provide evidence for it? It makes no sense to apply really tough regulation to these products and much weaker regulation to cigarettes when they are just competing to be alternatives to appeal to consumers. If the EU is determined to press ahead with applying medical regulation there should be three year transitional period to allow the makers to submit applications to sell these products and to ensure they don’t disappear from the markets overnight when the directive enters into force, thus forcing many users back to smoking. That products like e-cigarettes should remain on the European market – otherwise there will just be a flood of internet sales and all the business will be done with traders outside the EU. The European Union should find ways to encourage smokers to switch to e-cigarettes or smokeless tobacco, not ban or marginalise these products through regulation. Ask your MP and MEPs to reply to you… ask them to give their views on the parts of the proposed directive that deal with smokeless tobacco products and nicotine containing products. If you are an e-cigarette user, ask your MP and MEPs to give an undertaking that they will not support an EU directive that removes most or all e-cigarettes from the EU market, and point out this is important for your own health. Ask to meet your MP and MEPs, and tell them you would like them to understand why this matters to you by explaining it in person. Ask your MP to raise your concerns with the Secretary of State for Health (Rt Hon Jeremy Hunt MP) and Secretary of State for Business, Innovation and Skills (Rt Hon Dr Vince Cable MP). Ask your MP to ask them to press for amendment of the directive as it will harm health and works against the EU single market. Ask your MEP to raise your concerns with the Commission and to speak out in the debate in the European Parliament. Advanced! Ask your MEP to contact the relevant MEPs on the ENVI committee and to make their views known. If your MEP is on the ENVI committee, ask them to raise your concerns in the committee sessions that scrutinise the directive. This is a list of members of the ENVI committee or you can consult my more detailed guide on how this will all work. If you do write to a representative, then you could leave a copy of your letter here in the comments as an inspiration for others. If you have questions about the directive or disagreements with Clive's interpretation or advice, please comment on his blog and he’ll respond, and change as necessary.